Any Treonaut who has recently looked to purchase a new Treo case may have been somewhat overwhelmed by the breadth of choices available as there are now well over 100 cases across 14 categories. In addition to this there are also over 500 other Treo accessories. To become a “Bestselling Treo Case” any single item must therefore rise above 100 other cases and to become a “Bestselling Treo Accessory” it must climb above over 500 products overall. Given this highly competitive field, I thought that the time had come to give recognition to one item that has consistently managed to remain at the top of both bestselling charts for nearly two years now: the SPE P6 Pouch Case. 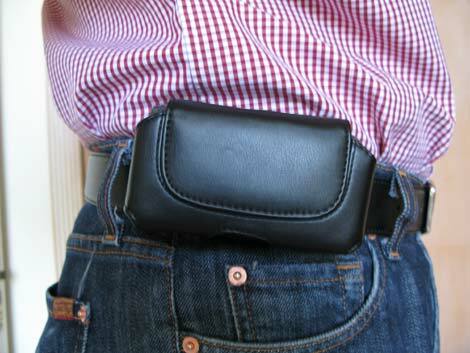 It is not difficult to understand why the P6 Pouch Case has proven to be such a popular accessory. There is undoubtedly a question of value with a price of $19.95 which makes it one of the most affordable Treo cases available. However, the fact that the P6 Pouch Case is affordable is only one small part of the overall equation and it’s really the design and build that make it stand out. 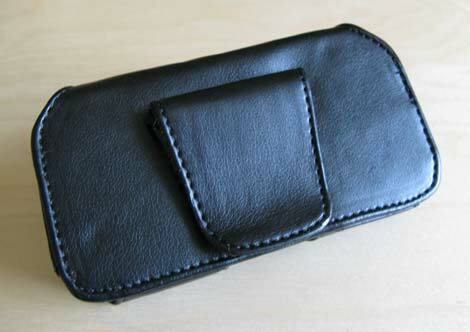 The P6 is a high quality universal leather case that fits all Treo smartphones and its best feature is probably the fact that it offers a very wide and strong front magnetic flap (above) which has been slightly recessed into the case to reduce the thickness and keep a very low profile (image below) without jeopardizing the protection. There is also a ballistic nylon front which gives it a very modern feel and a full velvet lining to ensure scratch protection. 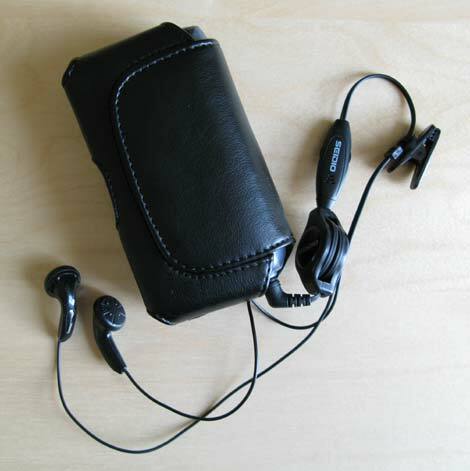 Next is the fact that the construction of the case offers five openings with the one at the bottom centre to allow your fingers to push your Treo out of the case and the top right/left openings allowing you to keep a corded headset (such as my Seidio 2in1 Earbuds below) plugged-in to listen to music while in the case. Finally there is a strong fixed belt clip to ensure that the case stays firmly by your side and within easy reach to answer calls or check your emails. Separately, I also like the fact that there is no logo of any kind to be seen on the front of the case. Overall the SPE P6 Pouch Case offers not only terrific value but also excellent protection in an extremely comfortable and well built package. It is also a case that has uniquely withstood the test of time by remaining a bestselling Treo accessory for years and I have no doubt that it will continue to do so for quite some time to come. While I do think this case is definitely one of the better ones, contrary to what's stated in every review I've seen, it is most definitely not made from leather. Unless the one my wife bought for me a year and a half ago happens to be the only one ever made that's vinyl. The photos look like this case is too thin for a Treo 680 with the "humpback" extended battery... anyone know for sure? TIA. Definitely a good case, although not great. As Waldo states, it ain't leather. On mine, the edges wore through to reveal the white fibers losing the professional look. The back piece of cardboard that provides the rigidity for the back became creased over time so the case actually tipped out from the top of the belt clip loosing the low profile status. I really liked my P6 case, but I am disappointed in the overall quality. I don't care for the P6 either. Had one and had the same problems Marc mentions above. I have the P7 now and it appears to be sturdier than the P6. The back piece has held up much better and longer than the P6 side case. I'm very dissatisfied with this case. My treo got quite beat up while in it. The leather is cheap and all it really has is some cardboard covered over top by inexpensive leather. Definitely one of my worst buys for treo accessories. Bill, 680 with humpback back will fit in case. The issue I have with this case it WILL SLIP OFF your belt! I like the case but gave up on it when it came off and my 680 went a flying! The thing I hate about the P6 is it can slip off your belt VERY easily. My favorite horizontal belt case is one I got off of ebay for about $12 (incl shipping), but in addition to the belt clip it has two belt loops. It looks VERY similar to the P6, but those belt loops make all the difference in the world. I never ever have to worry about it coming off, so I LOVE my cheap "fe" (that's what's embossed on the front) brand case. Mine is identical to current item# 260110155679 on ebay, or do a search for "treo leather case pouch holster" (yes, all those words) and you're sure to find it. Just look for the belt loops, which are pictured clearly in the ad. Though this one is also advertised as being leather, I'm not certain that it is. I thought it was the same case, as the pictures were practically identical. However, the case I ordered also has an internal elastic and mesh pocket for two SD memory cards held inside a flap that closes with button snaps. And it was cheaper! Double bonus! All said, I really like the case I ordered thus far. However, I do wonder how well it will hold up over time. 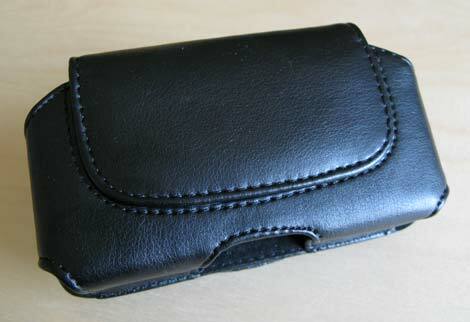 It seems to be virtually the same as this SPE P6 case, just with the internal pockets. My experience with this case was bitter-sweet. Love the size and functionality, but whether it's leather or vinyl (pleather), it may be too soft to stand up to normal wear-and-tear. I found that the belt clip leather wore through in less than 2 months of use, exposing the metal clip. I've had much better luck with the Palm-branded horizontal case -- it has an internal pocket for business cards or an SD card or two and the leather is still soft, but overall is a much sturdier case! Just my 2 cents. i hate the fact that i am not able to get this product just because treonauts shop does not ship to my country Malaysia. OMG, they added extra loops for the case not to fall off your belt. NOW this is the best case ever! I can't believe they actually added those things. Overall, it feels really resistant, and my 680 sits very well on the case. I like this case a lot, but it does have one big problem - it doesn't work well with scrubs (and I've tried it with several different brands of scrubs). I'm a nurse, so this is a problem! The case is easily flipped off my scrubs (i.e., I bump against a piece of equipment as I'm stooping downward, and the upward force on the case just pops the whole thing right off). I don't know what to do - can't wear a belt to work, so belt loops are not helpful. How do other healthcare professionals handle this - buy some sort of full-treo skin and hope the treo doesn't fall out of a pocket? Okay, listen up! I'm VERY picky, so I do lots of research. 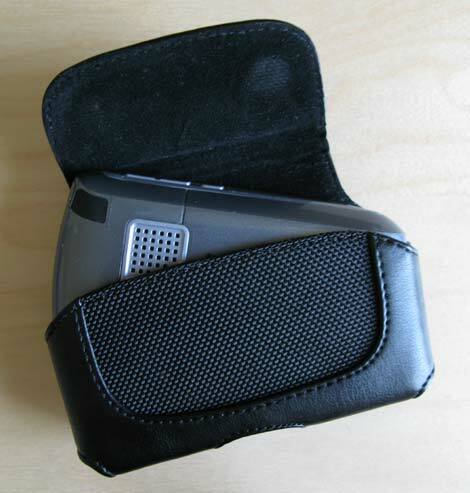 I had leather for the Treo 300, covered both parts so it was fully functional. 600, splurged on fancy soft lambskin with clear flexi-plastic over screen. One bump and it split the screen. Switched to RHINOSKIN aluminum case and loved it for remainder of life of both 600 & 650, protecting dozens of drops, a couple falls down stairs, clumsy smashes against doorways & such. Amazing case, but bulky. There's a magnesium case now which is lighter, stronger, & black. Both are lined with neoprene to absorb shocks, and trust me, they work. Now I have the 700 and went with something different, the SPECK PRODUCTS TOUGHSKIN. It's silicone rubber, tight-fitting, and has a hard clear plastic shield that flips up to use the touchscreen. All cases I've mentioned allow the Treo to still be fully functional without having to take it out of the case, which is absolutely indispensable for me. It's protected my Treo through a few drops so far, and it hasn't lost it's shape, stretched out, or diminished my Treo functionality. I've had it 2 months. To KATHERINE: The silicone case is very grippy, so it never slips in my hand, and it wouldn't possibly fall out of my pocket, as cloth really grabs it. They have both the TOUGHSKIN, and the SKINTIGHT, as well as others. The toughskin is a little bulkier, which was MY safest bet. Good luck! I agree totally with Brian. This is my second P6 case, and both have had the same "clip" problem. Within a couple of months the clip "leather" tears away from the metal clip and eventually the clip is totally exposed (not too executive looking). My last clip actually disconnected rendering the case useless for my belt. I will probably go with the Palm brand next time. I've seen others with this case, and it looks much sturdier. I purchased one and it was great. It is probably being used by some trucker, because it slipped off my belt at a truck-stop. Fortunately, I did NOT have my phone in it. I was very lucky. I replaced it with a look-alike (bought in Detroit, at a street fair) for $5.00; bought 2 of them. These are the identical same magnetic latch, but in addition to the belt clip, there are two belt loops, one on each side. While it takes one moment longer to put on in the morning, it doesn't fall off, unless I slip it off my belt. I like the pouch concept, but the belt loops, although I have to thread the belt thru the loop, clip, loop, is perfect for me.